If you love racing games, using a wheel controller can be a lot of fun. Whether or not it’s actually advantageous to your play, it’s immersive and authentic. It’s probably even part of the reason why people are willing to pump so many quarters into arcade machines, they often have the best controls. But the wheel is just one part of the experience of driving. What about shifting between gears? What about accelerating and throwing on the breaks? People love these kinds of games, from driving games to flying sims, so it’s not tough to find all kinds of special controllers and adapters to make your experience more immersive. But unless you’re a PC player, you’re not going to be able to plug in half-a-dozen different game peripherals. At least, not without the right adapter. Though finding the right adapter isn’t complicated when you’re willing to reach straight for the best. The Thrustmaster TM Sim HUB was designed specifically for the TH8A shifter and the TSS Handbrake Sparco Mod+. But it doesn’t stop there. The Sim HUB lets you access the entire Thrustmaster ecosystem on an Xbox One or PS4. Whether you’ve already got a pile of these controllers or not, that adaptation represents a huge gateway of opportunities. Like most Thrustmaster products, the Sim HUB is almost defined by its versatility. Thrustmaster could have easily made this adapter a proprietary technology, but it’s actually widely compatible with a variety of different racing wheels. Whether or not you can attach the wheels you have laying around at home is another question, but the odds are good. No adapter is perfect, but the TM Sim HUB gets close. In any case, it’s always worth taking a closer look at these kinds of products to make sure you’re getting exactly what you expect. Especially when you’re trying to connect several different types of peripherals through one unit – that kind of chaos can easily lead to a disaster of conflicting technologies. 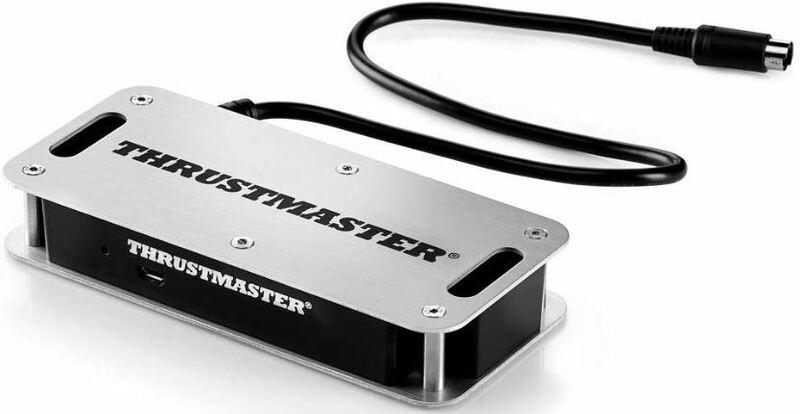 The Thrustmaster TM Sim HUB measures 6.8 x 4.7 x 2-inches, which is about as compact and portable as this type of adapter can be. Weighing just over nine ounces, it’s not quite as portable and lightweight as carrying a smartphone, but it’s certainly in the same neighborhood. Though more often than not, this lightweight and portable nature will be used to shove the adapter into a drawer, or to tuck it away with the rest of your controllers. 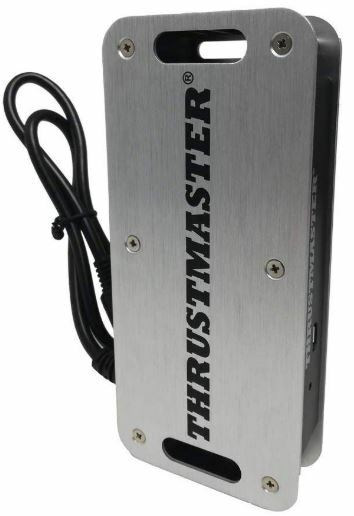 The adapter itself is as sturdy and professional looking as any of the Thrustmaster products. Thrustmaster’s designs are almost always made to give off a premium feel, and a sense they take gaming seriously. The TM Sim HUB looks like you could smash it with a hammer, and your hammer might be the thing to suffer damage. All five of the primary connection ports are placed across the front panel. Those ports are slightly recessed between the top and bottom plates of the adapter. It’s a protective positioning, similar to being wedged into the side of a cave. Additionally, along the outer edge of the aluminum casing, there are a pair of 1” openings. On either side of the Thrustmaster Sim HUB, these spaces make it possible to carry or hang the adapter with a lanyard. Though no lanyard or carrying cable is included, and these spaces will more often than not be used to help route controller cables. In addition to the connection for a wheel, the four add-on ports allow you to connect an additional four separate accessories. Once you’ve got everything fully connected, you can have four devices connected to the adapter, and the adapter connected to your wheel. It’s a maze of connections that might seem complicated from the outside, but actually setting it up is rather simple. The included connection cable is about eight inches long, and covered in a thick layer of protective shielding. In fact, the cabling is just as tough as the thick aluminum exterior itself. This extra protection is important because the cable is permanently attached to the adapter. The benefit to having it attached is you have no chance of losing the cable, and it’s pretty easy to store due to the chassis using multiple recessed storage areas. The downside to having the cable attached is that if the cable is destroyed, the entire adapter will perish. But again, the cable is virtually indestructible, and shouldn’t present a problem as long as it’s not issued an inordinate amount of strain on a regular basis. Getting started is actually simple. Just locate the TM Sim HUB DIN port, found on the backside of your racing wheel. If you want to play with more than one extra accessory with your Xbox One connection, this is mandatory for setting up the wheel. 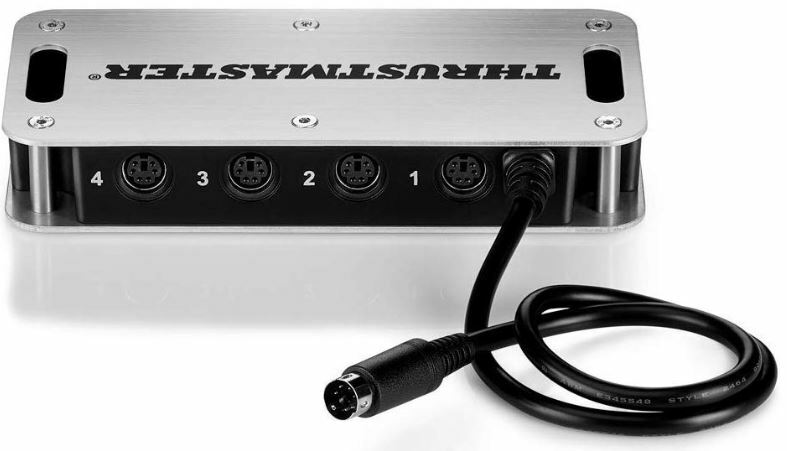 In either case, you’d connect the TH8A shifter or TSSH hand break to the next four DIN ports. The simplicity of these connections really underscore another thing, which is ease of use. You may notice the ports are not specially labeled or color-coded, beyond the fact they’ve been given numerical address, spanning one through four. That’s because connecting your gear to the Thrustmaster Sim HUB is really about as simple as plugging in a controller cord. The only a cable that needs to be placed with any degree of precision is the furthest port on the right, which is specifically for a racing wheel. If you manage to get four of five separate things plugged into the Thrustmaster TM Sim HUB, then it really starts to look like a maze of wires. And you begin to have a greater understanding of why there might be spaces on the side of the adapter to help route those wires. Thrustmaster’s design is nothing if not thoroughly well thought out. Using adapters on the Xbox One is slightly more complicated than using them on the PS4. Again, you need the Sim HUB to play with more than one add-on on the Xbox One. And then you need a wheel base which can use the DIN port on the Thrustmaster Sim HUB. The PS4 is somewhat more liberal by comparison. The PS4 allows you to support the TH8A shifter on the PS4 itself, or allow for a connection through the DIN port of the wheel base. The TH8A can be plugged into the PS4’s USB port, while the TSS hand break can be used on the wheel base. Though again, this sort of thing can vary depending on the support provided by the game you’re playing. With PlayStation 4, sometimes you may be playing a game that does not support a USB connection for the TH8A shifter. At that point, an adapter becomes necessary to play with more than one accessory. All of this sounds complicated, but it really just means one thing. As you move from game to game, and you find different levels of support for different game accessories, you might occasionally bump into the need for technical support. It’s worth noting Thrustmaster has a reasonably good support site that can help you work through almost any sort of technical issue that might crop up. Not only is their search database pretty good on its own, you can contact both forum users and staff members to help you along. The Thrustmaster TM Sim HUB is compatible with the T-GT and T-300 series wheel base on the PS4. For the Xbox One, it’s compatible with TS-XW Racer and TX-series wheels. The Sim HUB includes a user guide and a one-year warranty. The user guide is a fairly straightforward instructional guide on how to setup the adapter and all your accessories, including some useful illustrations. But the process is rather simple, so unless you’re a total novice with electronics, you can almost immediately discard the guide. Though the TM Sim HUB does not make you bound to the Thrustmaster ecosystem, there are benefits to being part of it. This adapter is going to be able to offer forward compatibility for future Thrustmaster products. And Thrustmaster is always coming out with new innovative designs, especially as new games are released. The next time they release a truly compelling racing wheel or similar accessory, you can be almost certain it will function with their adapter. Who Should Choose the Thrustmaster TM Sim HUB? From a physical standpoint, the adapter is rock solid, and clearly intended to last for years. It looks stylish and professional, and it’s small enough to carry around. The cabling is equally sturdy, though some may prefer if the cable were detachable. If you’re a fan of racing games and you enjoy playing on consoles, the TM Sim HUB is one of the only ways to get multiple game accessories to cooperate on consoles. In some cases, it’s the only way to connect Thrustmaster equipment at all. 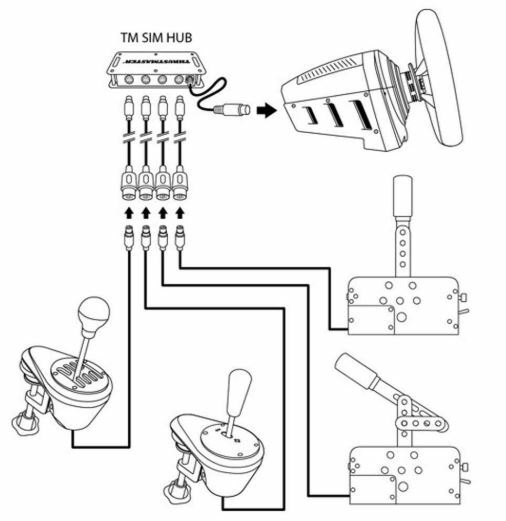 If you already have a few Thrustmaster controllers, picking up the Thrustmaster TM Sim HUB is almost a no-brainer. If you don’t, this adapter is capable of accommodating a variety of popular racing wheels. There’s really just one complaint that needs to be raised. You’re getting what you pay for, and you’re getting a lot. The Thrustmaster TM Sim HUB costs almost as much as a new AAA videogame, which makes it slightly more expensive than some people will want to spend on an adapter. A large part of the reason why gamers are drawn to the PC platform is because of the wide range of customization and setup potential inherent to the platform. For console players, the Thrustmaster TM Sim Hub lets you effectively match those kind of adaptive capabilities. Once you get everything setup, it all becomes worth the effort. Provided the price doesn’t scare you away, the Thrustmaster TM Sim HUB can deliver on all it promises.